Be the first to share your favorite memory, photo or story of Virginia . This memorial page is dedicated for family, friends and future generations to celebrate the life of their loved one. 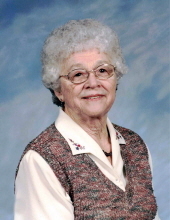 Virginia C. Meinke, age 98, of Faribault, died Monday, January 21, 2019 at Pleasant Manor Nursing Home. Funeral services will be held at Trinity Lutheran Church, Medford, on Saturday, January 26, 2019 at 2:00 p.m. with the Reverend Mark Biebighauser officiating. Interment will be at Meadow Ridge Memorial Park, Faribault. Visitation will be one hour prior to the service at the church on Saturday. Virginia, the daughter of George and Theresa (Tully) Anhorn, was born February 17, 1920 in Owatonna. On February 15, 1941, Virginia was united in marriage to Henry F. Meinke in Medford. She was a member of the Trinity Lutheran Church in Medford where she had been active in the ladies aide. Virginia helped Henry on the farm in Steele County for many years before working at the Faribault State School for 14 years. After her retirement, Virginia worked in the deli at Nelson’s. Virginia enjoyed spending her winters in Texas with Henry, walking, riding bike and most of all she enjoyed being around people. Virginia always had an infectious smile. Survivors include her children, Rolly (and Nancy) Meinke, Judy (and George) Pofahl, John (and friend Kris) Meinke and Jim (and Terri) Meinke; nine grandchildren; twelve great-grandchildren; six great-great-grandchildren and many nieces and nephews. Virginia was preceded in death by her parents; husband, Henry; two sisters and four brothers. "Email Address" would like to share the life celebration of Virginia C Meinke. Click on the "link" to go to share a favorite memory or leave a condolence message for the family.